I'm going intersperse my results with a few instructions so you can repeat the things that I've done below. I've some people writing that only experts should be analyzing data. But I disagree with those who say that sequence analysis should be left to the experts. Okay, expert input is important for the final interpretation, but there's no compelling reason to keep anyone from evaluating public data for themselves. A. What is question are we going to ask? How similar are the 2009 H1N1 sequences to each other? Why do we care? I think it would be a good frame of reference. 1. Go to the NCBI influenza resources database. Every time I visit, they have more sequences! This gave me 10 H1 sequences. I did two things to look at similarity. 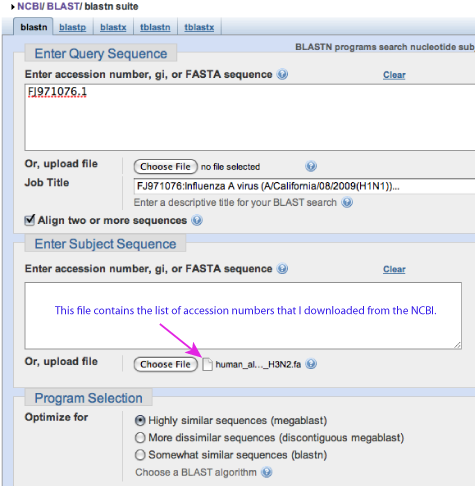 First, since I wanted to look at full-length sequences, I downloaded the accession numbers and compared them with BLAST. Second, I downloaded the sequences, and used JalView and ClustalW to make an image so you better see the similarity. 1. 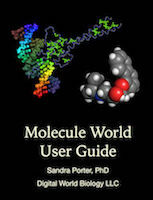 Go to the BLAST nucleotide page. I selected the checkbox for aligning two or more sequences since I only want to compare these sequences to each other. Then, I used one of the accession numbers as the query and all ten as the subject sequences. I had all these in a file, so I uploaded the file. 2. Then, I clicked BLAST. I found that all the new sequences (in my data set) were between 99-100% identical to the one I used as a query. That one, my positive control, was of course 100% identical to itself (surprise!). Changing the formatting to a query-anchored alignment, shows us a little bit about the similarity. I'm only showing part of the alignment in the image below, but you see from the few positions with differences, the sequences are pretty similar. These HA sequences are all really similar. That's why people are convinced that it's the same strain of virus, at least in Texas and California. But, how does this compare to other HA proteins? There's a really nice, user-friendly program called "JalView" that I like to when for working with multiple sequence alignments. JalView has some web connections that you can use to do multiple alignments with the ClustalW or Muscle algorithms. It's easy to edit, add, or group sequences. And, most of all, I love the coloring options. In JalView, I added a human H3 nucleotide sequence for comparison and did a multiple alignment with ClustalW. Three pairs of HA sequences were identical, so I put those into groups. Then, I colored the sequences by identity to make the differences stand out. 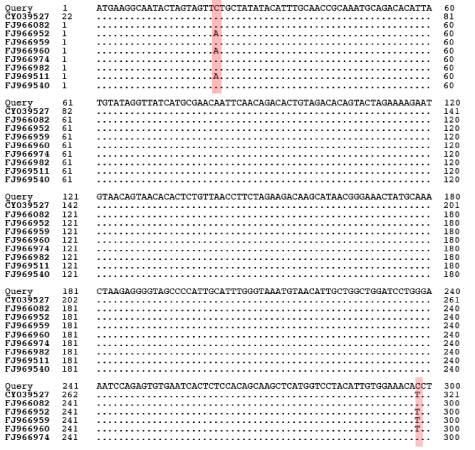 The top picture shows part of the sequence, the bottom image shows the nucleotide sequences from the entire HA segment. Groups of identical sequences appear as dark bars and any differences appear as white lines. The H1 nucleotide sequences from the April 2009 outbreak (in California and Texas, at least) are at least 99% identical. The H3 sequences is very, very different (about 50%) from the H1 nucleotide sequences. Next - what do we see when we blast the whole database?